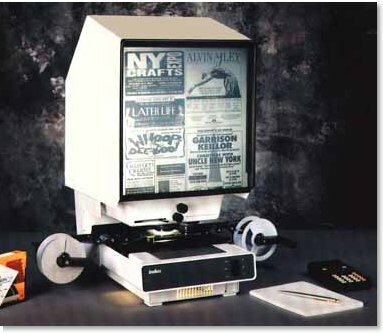 The Indus 4601-11 Microfilm reader has an A4 size screen for reading Source Documents at full blowback from 16/35mm rollfilm and for COM microfiche at 3/4 blowback. There is standard 360° image rotation for one lens in the single lens version and for two lenses in the dual lens version. 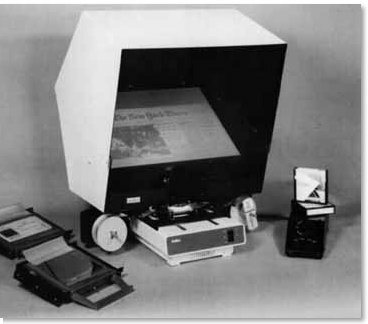 State-of-the-art features such as works-in-a-drawer, dual intensity long life lamp, central control for focus and image rotation make the 4601-11 a very versatile microfilm reader reader. An optional carrying handle is available for easy portability. Electrical: Standard – 120V. 50/60Hz. Optional – 220/230/240V, 50/60Hz. CE mark. The 4601-A3 U is a universal microfiche, aperture card, 16mm and 35mm Microfilm Reader. It has a large screen for crisp and sharp images from Document Microfiche, 16mm microfilm and full frame viewing of the 35mm film. Image rotation is through a single prism on single or dual lens for 24X, 32X and 36X, and with a second prism when the 12.5X lens is used. Changing from the Fiche Carrier to the Rollfilm Carrier is simple. This energy efficient reader has a convenient removable power drawer..
Manual roll film carrier, 12″x16.5″ screen, 12.5X and 24X lenses, 360° image rotation on 24X lens.